Canelo Alvarez holds the WBC Middleweight title and last week became the richest athlete in sports with Matchroom Boxing and DAZN. Saturday evening two championships in the division changed hands and now the middleweights are the talk of boxing. 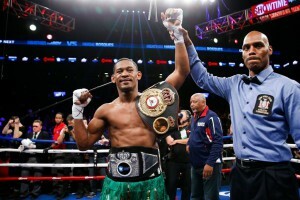 “The middleweight division is class,” Hearn said on a conference call Monday afternoon. Hearn now has rights to Canelo Alvarez and said the winner of Jacobs-Derevyanchenko could fight Alvarez in May. Eddie Hearn could be the promoter that gets the unity accomplished. Again, he has been at the forefront of changing the complexion of the sport with DAZN and signing big name fighters. but is also motivated for something bigger, a piece of this middleweight title. “This is a respected belt,” he said. More so, this is how Daniel Jacobs gets out of the middle of this pile and once again becomes a dominant middleweight. And all you have to do is listen to co-promoter Lou DiBella. His perspective of where this division will stand after the Jacobs fight does speak volumes. That elite division of welterweight champions and contenders is in good company.